Sasha (Leighton Meester) and Paige (Gilliam Jacobs) are best friends who are just a little co-dependent. Their relationship is tested when Paige meets Tim (Adam Brody) and has a serious boyfriend for the first time. Life Partners is a great take on female friendship and the ups and downs of a friendship as you go through different life events. While the same age, Sasha and Paige are at different stages of their lives. When Paige meets Tim and starts to think about settling down, Sasha is still going out and dating girls who are younger than her and, more often than not, still live with their parents. And it’s not even their relationships that are different, it’s the career paths – Paige is a lawyer while Sasha has been a receptionist for years, so she can focus on her music. These are two very real and relatable women and their friendship is relatable too. Both Sasha and Paige have their flaws and seeing them begin to recognise them and try to change or apologise, was lovely to see. The script is funny and heartfelt and allows these two female characters to be layered and their friendship is never stereotypical. Meester and Jacobs have great chemistry, as do Jacobs and Brody, meaning that when Tim comes into the picture, you root for him because he makes Paige happy but can see how insecure he’s making Sasha at the same time. Life Partners has a great balance of romance, humour and drama that makes it feel very true to life. 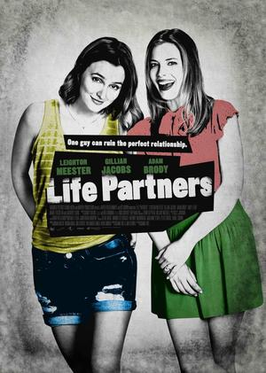 Life Partners is a character-driven film about two young women and the pitfalls and confusion they encounter when trying to be adults. Their friendship is at the heart of this film and thanks to a great script and cast it’s a friendship and a story that just works. 5/5.